Inflammatory bowel disease (IBD), such as Crohn's disease and ulcerative colitis, are chronic inflammatory diseases of unknown cause, and the number of IBD patients is on the rise. Various inflammatory cytokines, including TNF-α and interleukin-6 (IL6), damage the intestinal wall, causing IBD. Thus, the cytokine signaling pathway has become a therapeutic target. Several types of microRNAs (miRNAs) to suppress the production of inflammatory cytokines have been clarified; however, there were no methods for efficiently and stably delivering miRNAs to the affected area. miRNAs can be unstable in the blood, reducing their transfection efficiency to the target cells, so the use of miRNAs for treating IBD has rarely been attempted. 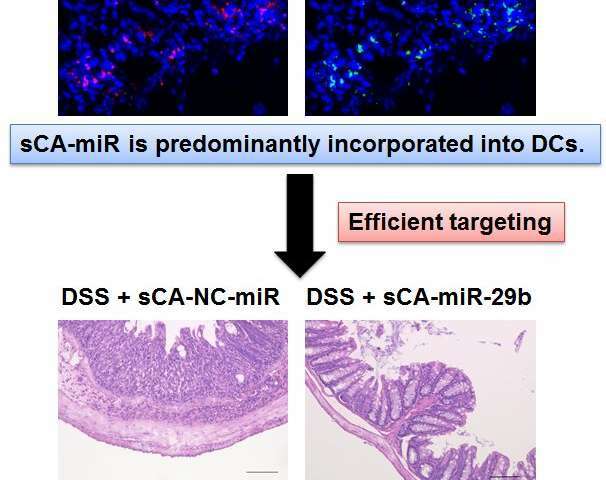 Osaka University researchers efficiently delivered miRNAs to immune response cells in inflamed intestinal tracts using a super carbonate apatite (sCA), which had been shown to be highly effective in the delivery of nucleic acids to solid tumors, demonstrating the efficacy of sCA in the prevention and treatment of colitis in mice. Their research results were published in Molecular Therapy-Nucleic Acids. The researchers performed systemic administration of RNA (miR)-29a and miR-29b (both of which suppress inflammatory cytokines) loaded on sCA to IBD model mice. Although miRNAs didn't accumulate much in the inflamed intestinal tracts, inflammatory cytokines were reduced, exhibiting the effects of prevention and treatment of colitis. 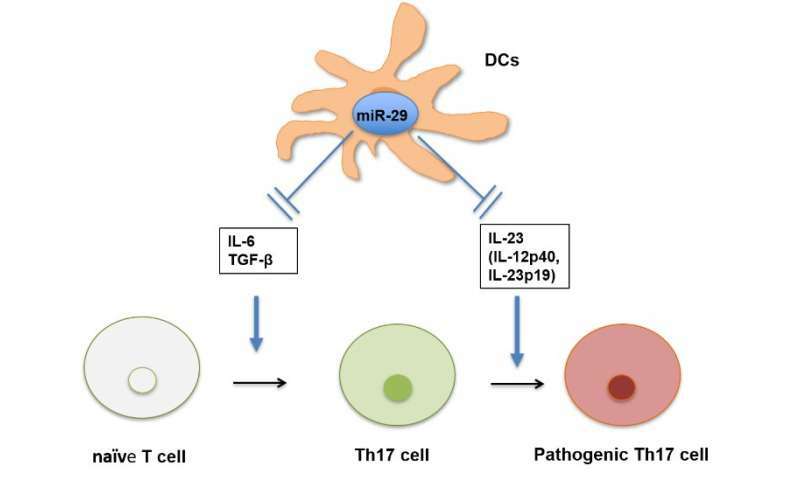 In addition, it was found that miRNAs loaded on sCA were efficiently delivered to the inflamed intestinal tracts' dendritic cells (DCs), which play a central role in immune responses, suppressing the production of inflammatory cytokines. This study clarified that the sCA functioned as a unique system for delivering nucleic acid-based medicines such as miRNAs to DCs in the affected area to suppress inflammatory reaction at the molecular level, exhibiting the effects of prevention and treatment of colitis. Corresponding author Hirofumi Yamamoto says, "Our technique to deliver miRNAs to DCs, major players in immune responses, will shape the future of medical care. sCA can be used to treat a wide range of immunity and allergic disorders caused by immune responses. The results of our study will lead to the development of new drugs for treating these disorders."